Discover Falcon Windows Warm Roofs Suffolk - the innovative home improvement that's out to transform conservatories and extensions into great, useable year-round spaces. Ever felt just a little disappointed by your traditional-style conservatory? It's a fantastic place, but it only comes into its element at certain times of the year. At Falcon Windows we've been listening to many of our customers who'd just love to make more of their conservatories. They tell us how in the summer months the space can simply become too hot, and in winter, all too chilly and totally impractical to heat. That's why we're delighted to offer both customers with an existing conservatory and those looking to have a new conservatory added to their property the chance to fit a Falcon Warm Roof - a highly insulated alternative to traditional conservatory and extension roofing which solves the problem - as you'd expect from Falcon - with flying colours. 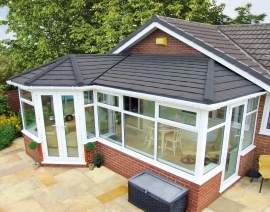 Falcon Warm Roofs are highly insulated, superior lightweight aluminium frames and high-tech 'tiling' systems, designed to be accommodated in your new conservatory or to be retro-fitted, to replace your existing glass or polycarbonate conservatory roof. 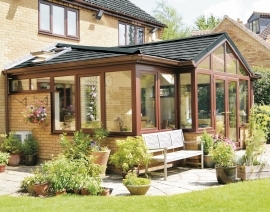 Our SupaLite warm roof and Guardian warm roof technologies can transform your conservatory into a beautiful, year-round garden room in just days. Engineered for quality, properly ventilated and fully tested and approved to all thermal and structural standards, the warm roof systems carefully selected and installed by Falcon Windows Ipswich have the appearance of a slate or tiled roof and can accommodate roof-lights or roof windows if required. The superior aluminum frame is lightweight and avoids not just the weight, but shrinkage issues experienced with timber. Manufactured pre-assembled, the frames are available as both standard and bespoke solutions. 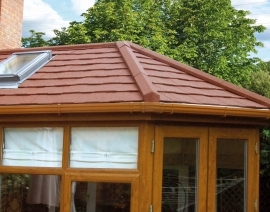 The high-tech, long-lasting and recyclable Falcon Warm Roof 'slate' or 'tiling' systems are not just extremely durable, impact and heat resistant, but offer the highest level of UV protection - so the temperature inside your conservatory can be controlled. Together with the high level of insulation, this new roofing technology delivers great energy efficiency and noise reduction too. What does a conservatory with a Warm Roof look like? Whether you have an Edwardian, Victorian, lean-to conservatory, another standard style or have or are looking to create a bespoke space, the warm roof frame will be designed to match your requirements and follow any existing glazed walls. The choice of Warm Roof coloured 'slate' or 'tiling' systems allows you to create a look which blends in with the style of your property and can also accommodate roof-lights or roof windows too. 'Slate' options are light-weight alternatives to regular slate, made of more robust and fade-resistant resin-bonded, crushed natural stone. 'Tile' options are made of light-weight coated steel, fixed without nails or fittings which would otherwise make them prone to corrosion. To find out more about warm roofs on lean-to conservatories, Victorian conservatories, Classic / Traditional conservatories and porches see our case studies (below) or read more about them here. How are Warm Roofs constructed? Our SupaLite warm roof systems and Guardian warm roofs share many common elements. Both consist of a hi-tech aluminum frame, exterior grade plyboard, breathable membrane and innovative slate or tiling system, plus layers of high-performance insulation. The design, look and performance of the two systems vary slightly and we are pleased to discuss specific requirements in detail, and to offer both impressive warm roof technologies to give our customers a choice of what we consider the best quality systems available on the market. Why choose a warm roof from Falcon Windows? When it comes to looks, installation, practicality and a straight-forward installation process, nothing quite compares to a warm roof from Falcon Windows Ipswich. The innovative systems have been purposely engineered for the replacement of existing conservatory roofs or as an alternative to a glass or polycarbonate roofing structures. Falcon Windows Ipswich have extensive experience in installing warm roofs in Ipswich, Suffolk and Essex. 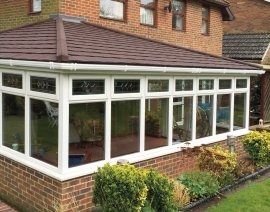 Although there are many other roofing systems on the market in Ipswich and Suffolk, SupaLite and Guardian warm roofs are from our experience, the alternative roofing system of choice and premium conservatory roofing option for home-owners. 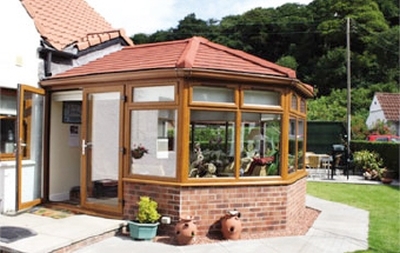 Interested in a warm roof for your conservatory? The Lean-To warm roof from Falcon Windows Ipswich forms an ideal extension to any kitchen or dining room, expanding the household usable space at the back of a house. It can be positioned with one or two slopes and can go as low as 15 degrees with roof windows. Innovative warm roof technologies can turn a once cold and lifeless lean-to conservatory into a warm, usable room all year round. The best thing about these solid conservatory roofs from Falcon Windows is that they can be custom-made and built specifically to the requirements of each conservatory, whilst still offering the thermal performance you would expect from an extension. After a period of years, the comfort value of most Edwardian conservatories tends to decrease - you may have noticed that your Edwardian conservatory just doesn't offer the level of comfort that you'd really expect nowadays. Fitting a Warm Roof from Falcon Windows can make all the difference, transforming your conservatory into the year-round sitting, dining or playroom area which you've always dreamed of. Even the most complex design shapes can be adapted to suit a brand- new solid roof. And thanks to the 'slate' and 'tiling' options and extensive colour ranges in our warm roof product ranges, finding the right style of roof to match in with your property is so easy. The thing about a Victorian style conservatory is that its angular shape enables you to look out over and enjoy your garden from different inside viewpoints. So, it's a real pity if you feel that you can't 'get into the garden' like this throughout the whole of the year. A Victorian warm roof from Falcon Windows in Suffolk makes it into a real garden room, so you can sit back and see the seasons take their course whatever the weather - without overheating or ever feeling the chill. It's all because these solid roofs have vastly increased the long-term thermal insulation of conservatories - where glass or polycarbonate roofs saw heat build up or evaporate away, the innovative technology behind the lightweight aluminium frames and roofing systems are highly energy efficient and mean that the temperature can be controlled really effectively even the height of summer or winter cold snaps. When Falcon Windows installs a warm foof on a Victorian-style conservatory, we make sure that the existing pitch of the roof is sustained, to keep to the same angle of the roof. Inside, the roof is completely transformed into a bright and light area and many people have spotlights incorporated within the new plaster ceiling to give a real modern look to the inside. This is the traditional and classic style of a warm roof which we can install for you here at Falcon windows. One of the Falcon Windows customers who recently replaced their traditional conservatory roof like this said: 'We've had our new roof on our conservatory for about four months now - and we just wished we had replaced it earlier!'' So what sort of difference can the installation of a Falcon Guardian or Supalite warm roof actually make? Homeowners comment on the extra room space they win; the exceptional design and style which transforms the space to give a really pleasant and modern - and then there's the sheer thermal performance which delivers all sorts of cost-savings. 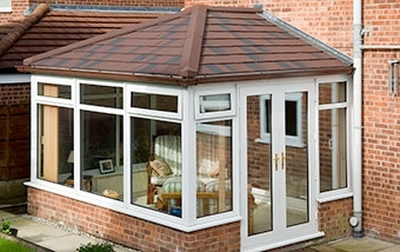 A Falcon Windows warm roof on your conservatory makes financial sense. Year-on-year, it offers the chance to save on your heating bills, as the efficiency of these roofs is simply second to none. The majority of estate agents agree that these roofs add value to any property and what's more, they come with a minimum 40-year guarantee. That's complete peace of mind, and you can rest assured that a warm roof installed by Falcon Windows will be to the highest standards, thanks to our fully trained installation staff. We all tend to take porches for granted. They're normally at the front of the house with a free faceted roof with two hips with an integral guttering system. Sometimes cold and uninspiring, but very useful places - somewhere to take off your wet clothing before you walk through your front door especially in the winter months. With a 'warm' porch roof from Falcon Windows, you can transform this additional space and make you house even more welcoming. 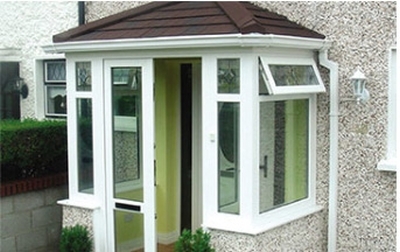 A warm roof porch adds extra security too and gives another barrier to your front door, adding value to your property. Porches may be small, but with the warm roof's internal flat plasterboard ceiling painted white to reflect the light, it immediately makes things feel brighter and more spacious. You can be sure that externally, the warm roof will blend in with the existing roofing materials on your property for many years to come as there's good selection of styles, and colours are virtually fade-free. Our innovative roofing products have been tried and tested to such levels that the lightweight tiles even come with a minimum 40-year guarantee. 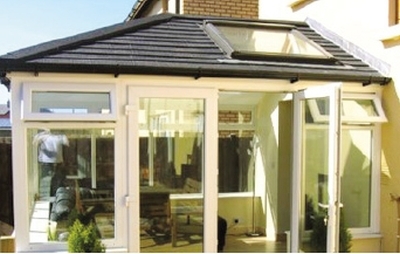 Roof windows are an option for your conservatory warm roof. They have a central pivot and are the most popular type of roof window on the market. This central pivot helps the sash to be opened in a range of positions, increasing the flow of fresh air which can be drawn into the conservatory. The lockable sash can also be rotated through 180 degrees to permit safe and easy cleaning of the outer panel. These roof windows allow a vast amount of light into the conservatory, giving it an airy feel and making the room look and feel bigger from inside. It has to be one of the pleasures of owning a conservatory, to be able to sit on a Sunday morning reading the paper, looking up through the roof vent into the blue sky on a nice summer's day! Falcon warm roofs meet all building requirements and regulations. The systems have revolutionised the future of conservatories and are proving extremely popular as a practical and economical way of turning a little-used conservatory space into an extremely usable extension. Why not get in contact with Falcon Windows now to find out more?